A. I work in many mediums and styles, but this is my favorite piece so far. 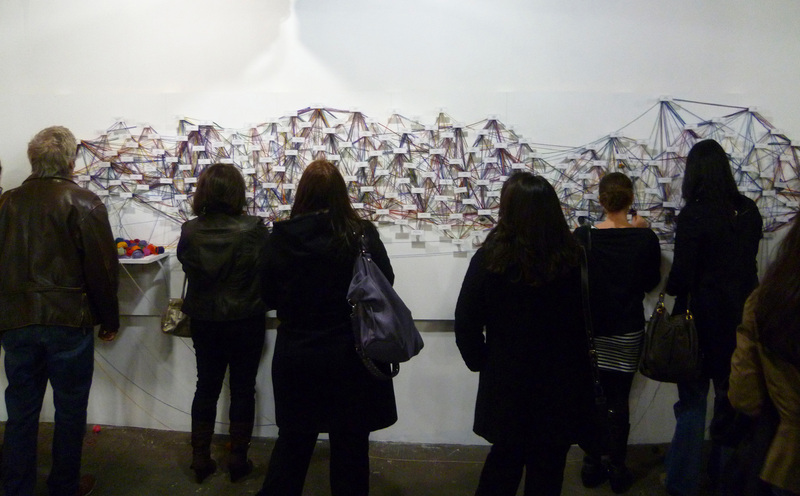 Identity Tapestry is a Participatory Installation. Each participant selects a color of yarn (out of 300 some uniquely dyed skeins) to represent them. 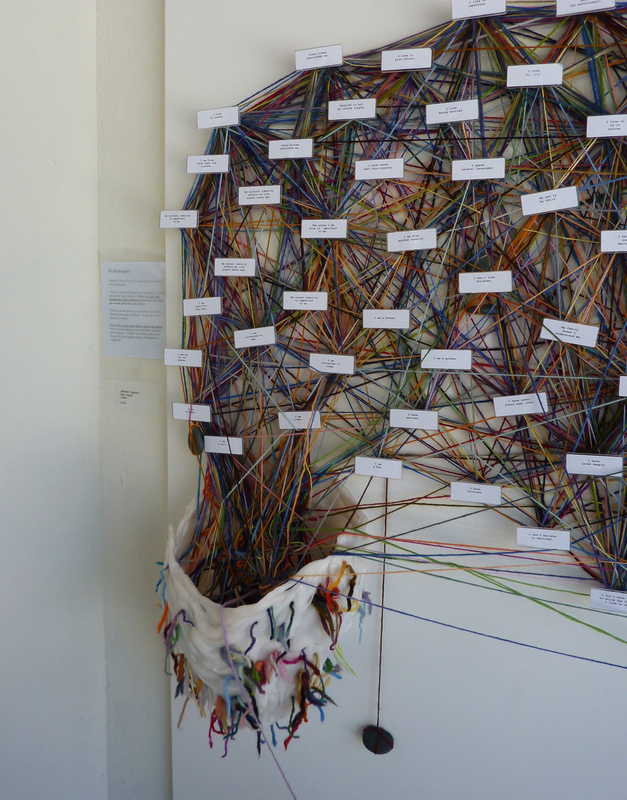 They then wrap the yarn around the identity statements they feel are part of their identity. Some of these are simple “I am a woman”, “music moves me” and some more hard-hitting “I have fought in a war”, “I have seen a someone dying”, and even “I have been raped”. 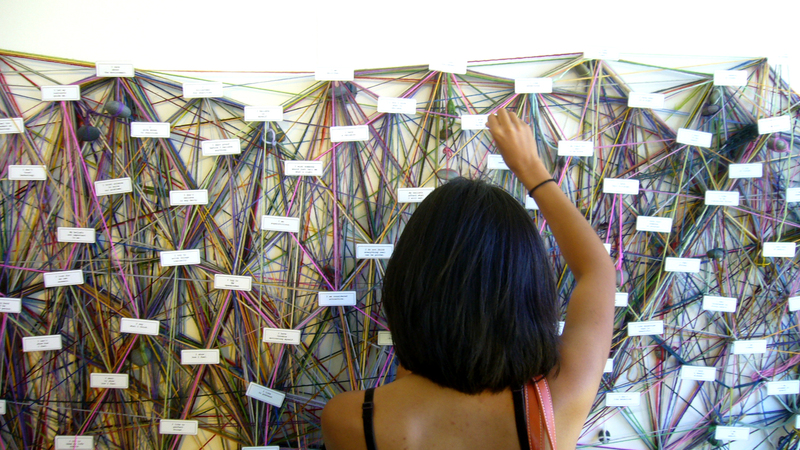 As more and more people overlay the strands of their lives the interconnections and common human experiences become visible, forming a Tapestry of human identity. I tried to get the whole spectrum of human experience there, taking the statements from many sources, in particular by talking to strangers. It was important to me to include things that I wouldn’t think of because they were so foreign to my own life and experience. I also made sure that statements were open. For example: there is no “I am gay” statement. Instead you can link “I am a man” with “I am attracted to men”. This means that you have that much more in common with other people. 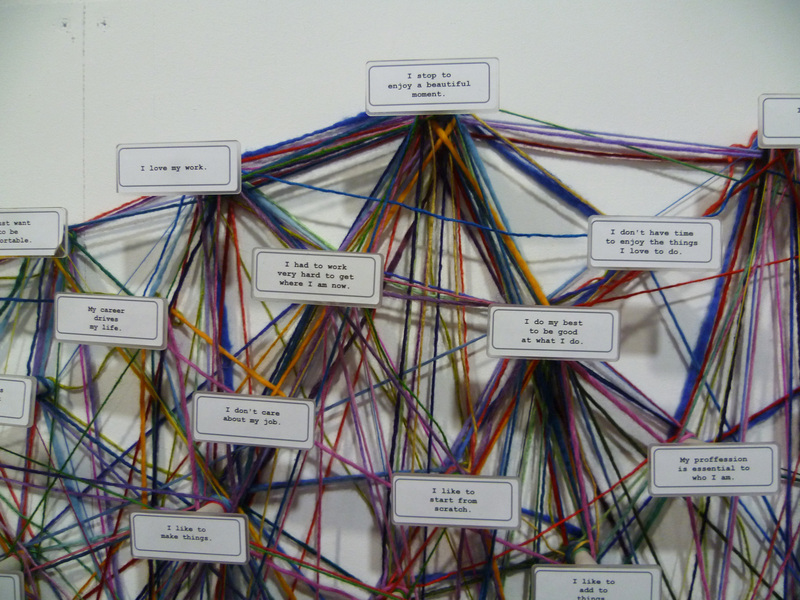 One person could link “I am a woman”, “I am a man”, “I am attracted to women”, “I am attracted to men” and “I define my own gender” rather than be narrowly defined they now get more specific and they can see more of their connections with other people. The new iteration begins with the yarn in a nest/egg/womb-shaped object. As you unroll the yarn a stone it exposes the stone inside which becomes a sort of memorial marker- the course of a life. A. Advice to other artists? If you want to get anywhere as far as showing your work you need to take care of all the non-art parts of being a professional artist. Find listings of open calls for art shows (nyfa.org, wooloo.org, artlist.com, etc.). Apply to at least one thing a month. Get rejected, apply to more until you start getting in. When you first start “blind” juries that don’t care about your resume are great. Write a resume and keep it up to date. Get a webpage and keep it up to date. When you have open studios or shows, collect a mailing list and when you have the next show send it out. Read Art/Work to get a sense of how to handle your relationships with galleries (and how to get a gallery relationship in the first place) and how not to get taken advantage of. It’s a great resource for nearly everything about the business side of being an artist. Silvia White’ archived advice to artists is also helpful: http://www.artadvice.com/blog/. Basically, no matter how good you are until you start doing these things your chances of getting anywhere are slim. Don’t get discouraged by rejections, just keep getting your work out there.